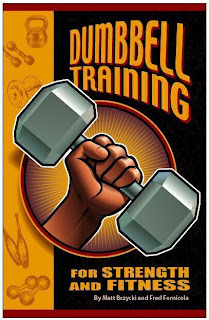 “Dumbbell Training for Strength and Fitness” by Matt Brzycki and Fred Fornicola is not your conventional “how-to” book that you’d usually find in any bookstore or Internet site. With an emphasis on safety, this book thoroughly covers all aspects of proper strength training while simultaneously debunking certain myths and misconceptions such as explosive training and sport-specific training. The book shows how to perform nearly 50 exercises with dumbbells in a safe and effective manner. Unique to this type of book is the inclusion of more than three dozen dumbbell workouts that have been submitted by approximately 24 strength and fitness professionals from across the country along with an additional dozen challenging dumbbell workouts and finishing routines. Steve Baldwin, Drew Baye, Randy Berning, Michael Bradley, Jim Bryan, Luke Carlson, Brian Conatser, Michael De Joseph, Jeff Friday, Jason Hadeed, Chip Harrison, Aaron Hillman, Gregg Humphreys, Sunir Jossan, Tom Kelso, Sam Knopik, Aaron R. Komarek, Kristopher R. Kotch, Mike Lawrence, Dr. Ken Leistner, Ken Mannie, John Mikula, Willis Paine, Adam Rankin, Jeff Roudebush, Doug Scott, Mike Shibinski, Rob Spector & Scott Swanson.